One by one the candles were lit, a steady stream that ran across the six football pitches stretching the width of Victoria Park, spilling over into the nearby basketball courts and central lawn. 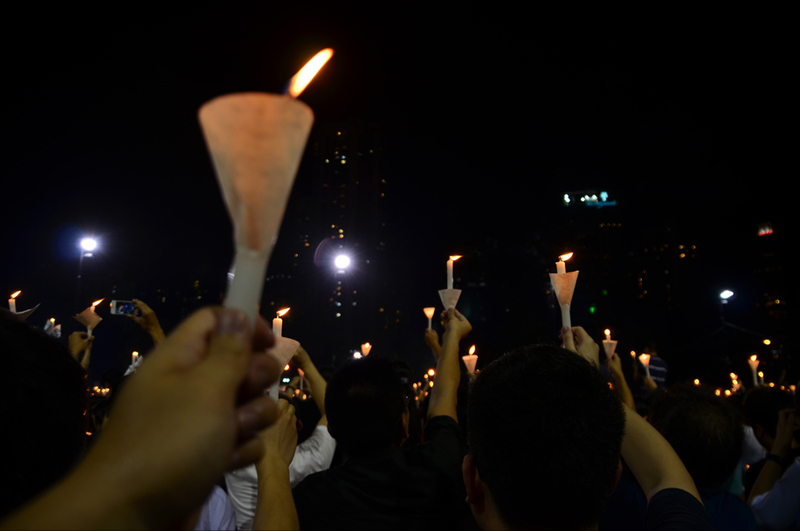 For the first time I was attending Hong Kong’s annual vigil commemorating the Tiananmen massacre of June 4, 1989, in the middle of a crowd numbering over 180,000 by organisers’ estimates. Here was a mass of citizens united in collective grief and anger, singing songs of remembrance. 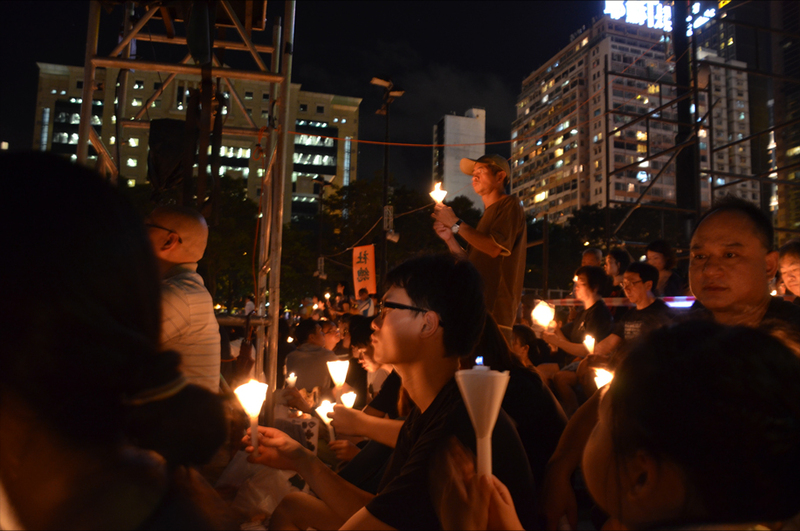 The spotlight moved onto a small group of protest leaders, who solemnly carried an intricate floral wreath ringed in white – the colour of mourning in Chinese culture – while others read out the names of many Tiananmen victims, their ages, and how and where they were killed. Their overlapping voices reached a powerful crescendo as I listened in stunned silence. These victims came from all ages and walks of life – high school and university students; a nine-year-old girl shot to death at Muxidi, where the fiercest street battles took place; and a 41-year-old engineer killed outside the Beijing Hotel, which was then full of foreign correspondents and observers. One of its guests at the time was Hong Kong activist Lee Cheuk-yan, now a leading figure of the territory’s pro-democracy camp. In a recent interview he recounted the “darkest hour” of his life, when he watched in horror from his balcony as the lights of Tiananmen Square were suddenly switched off. Then, the sound of gunfire ringing out in the darkness. 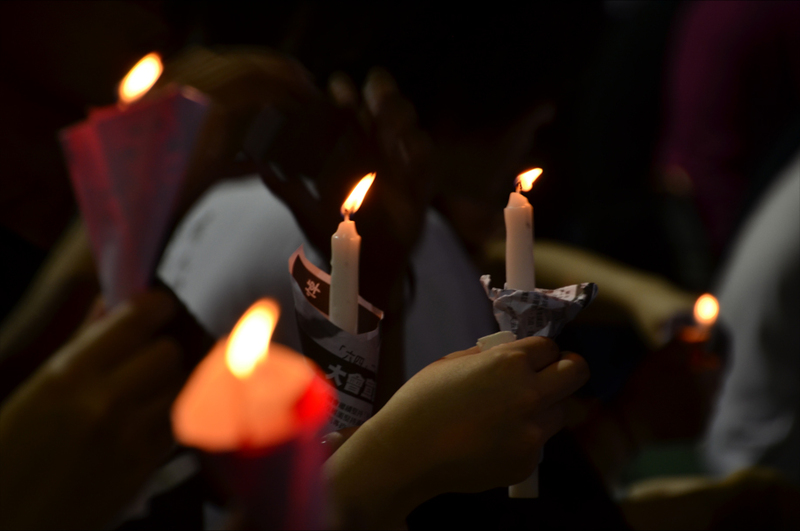 We watched harrowing footage of the violent crackdown, messages of support from exiled student leaders of 1989, and a video tribute to the Tiananmen Mothers, who continue to be persecuted for daring to seek justice for the deaths of their only children. A protest leader recited the names of those mothers who had recently passed and the entire audience bowed three times in honour of the dead. Thank you for the post! Encouraging to see so many people in Hong Kong not taking their freedom for granted, and standing up to commemorate the sacrifice. I wrote yesterday about the events in Tiananmen and the government censorship, and heard from a fellow student of my university who is from China. 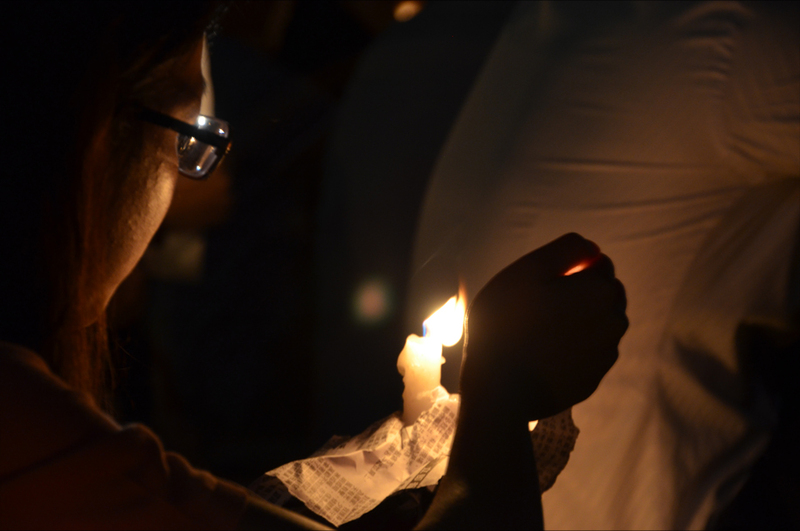 She said that her parents would remember the events and their friends who died every June 4, but were too afraid to tell her what really happened. Hopefully one day all of China will have the same freedoms as Hong Kong. And thanks in turn for yours, Andre! I grew up hearing firsthand accounts from a teacher who lived in Beijing at the time… she explained that Beijing troops refused to fire on their own people, so the Communist Party had to bring in special forces from other provinces. 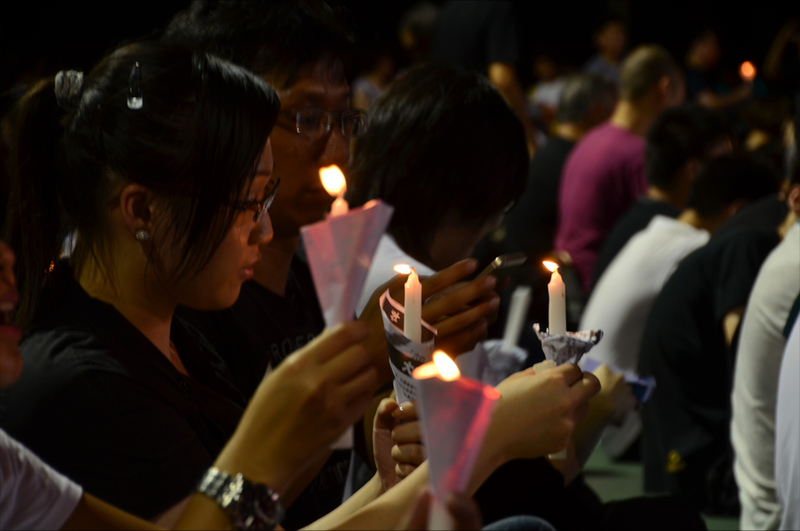 I wish for the same thing – to have an open commemoration on Tiananmen Square itself would be a real sign of progress. Thank you, Meredith. 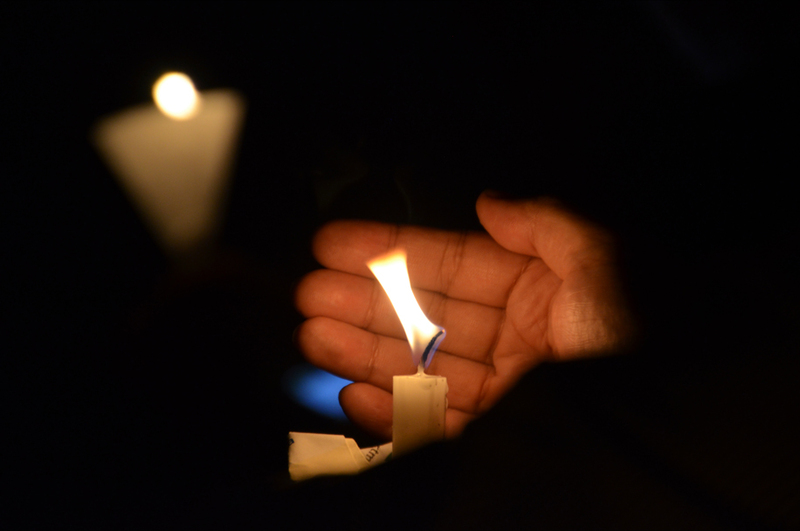 It was a poignant and deeply emotional experience – and I was moved by the sheer numbers attending the vigil. What also struck me was the fact that so many were young students born after 1989. Hong Kong is seeing the rise of a politically active and increasingly vocal generation, with students now at the front lines of many protest marches. Yes, and it’s they who might make the difference in 2017, hopefully. Lovely post and beautiful photos James. I’m encouraged by the large numbers who showed up for this remembrance and protest. Apathy is a devious destroyer. I couldn’t agree more, Alison. 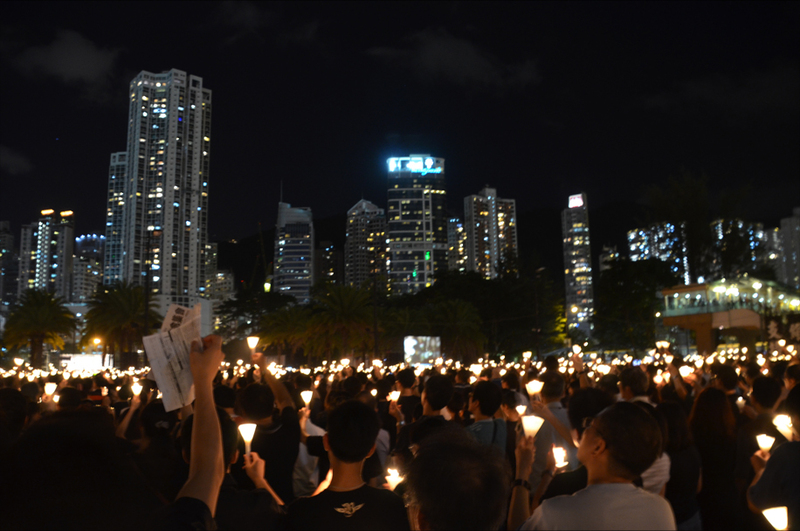 We even had people from Mainland China coming to Hong Kong so they could take part in the vigil – one was a well-known human rights lawyer and activist who fearlessly addressed the crowds from on stage. Thank you for sharing this important anniversary with us James. Your photos are beautiful and touch my heart. I appreciate it, Sue. China may be under an enforced amnesia but the rest of the world still remembers. Such a nice post, and great photos too! Seems like a wonderful and touching thing to be able to experience a night like this. Oh, it was a real privilege to remember June 4th so publicly and stand up for our rights. Beautiful and touching pictures ! As long as the ‘flame’ glow, there certainly is hope for a change. Best wishes ! It’s as if I was there. Very well written, you can almost feel the emotions. I’m glad you could get a sense of how it was – thanks for that. A beautiful post James. It is so hard to believe that given China’s huge economic engine that they can still get away with such a lack of human rights. I can’t see it lasting forever but then again I’m shocked it has lasted so far. Yes, after Tiananmen the prevailing attitude was minimal political dissent in return for economic development. Then there is also a blanket of hyper-nationalism, which really worries me as people are blinded to the fallacies of the official line. Yes it is a difficult situation. I really hope things someday get freer there. 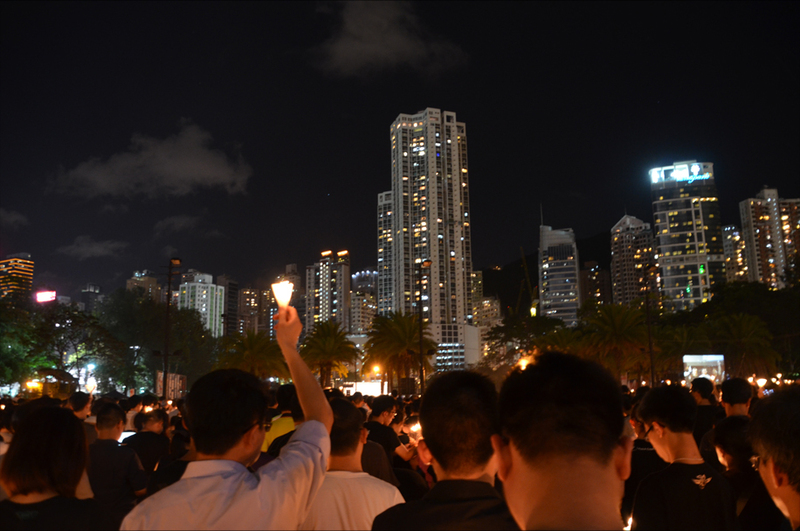 It is so encouraging to see such a large number of people commemorating the massacre, and it’s even encouraging to know that some people came from Mainland China to Hong Kong to take part in the vigil. The recent opening of a museum in HK dedicated to the massacre is a commendable gesture because that’s the only place in Greater China where people can learn about what really happened on June 4, 1989. In Indonesia there’s a popular hashtag related to such thing: #MelawanLupa (against oblivion), because forgetting doesn’t solve anything. Such a moving story, James! and beautiful photos as well. Absolutely, Bama. Forgetting would be a victory for government censorship – that’s the last thing the witnesses of June 4th would want. Thank you, Madhu – I too was encouraged by the huge turnout. I wonder why I waited this long to attend the annual vigil; for one of my friends it was her 20th time there! I was going to say that India could be a role model for China, but I know precious little about the system or the problems that lie within. Hardly James. We are certainly free. But freedom is becoming increasingly synonymous with lawlessness. The only thing we do right – every single time – is the way we use our ballot, even when our options are limited! We have a brand new PM, that I had reservations about because of his non secular baggage. The majority though, and that includes (R and our son -in-law!) think he is the person to lead us out of the mess we are in. I hope for all our sakes they are right.